Celebrities hunt for antiques across the UK. 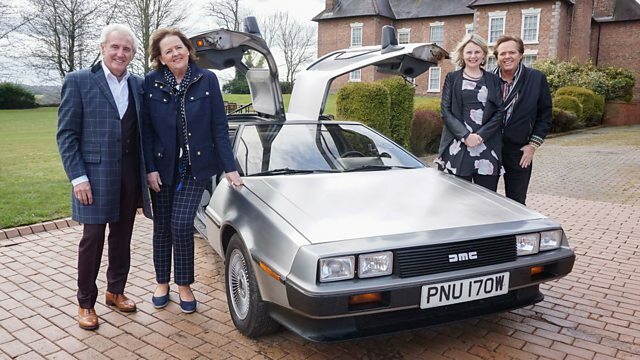 Cool crooner Tony Christie and pop royalty Jimmy Osmond head for an auction in Stoke-on-Trent. Browse content similar to Jimmy Osmond and Tony Christie. Check below for episodes and series from the same categories and more! from the velvet bell-bottomed decade of the '70s. Jimmy Osmond and Tony Christie. So you've recorded a million things. -Obviously Road To Amarillo is the big one, right? I'm Long Haired Lover, I'd rather have yours. I mean, I enjoy singing Amarillo. As soon as I start it, everyone starts singing with me. Oh, I like it, Margie! Back in the '70s, Margie was a hot-to-trot model, you know. And Catherine? Well, she was winning bonnie baby competitions. to parade around the country. -So how do you like this car, huh, Bentley? It's great. Takes me back to the '70s when I used to have a Rolls. for a certain 1971 sing-a-long ditty. # Is this the way to Amarillo? Don't you love that song? and super successful pop dynasty The Osmonds. he hit the big time by going straight to number one in 1972.
and it looks like Jimmy wants to win. We're not on a team, we're competitors. You'd better watch him, Jimmy. best known as the time machine in the Back To The Future trilogy. But we've got wings, haven't we? We could fly in this. Er, I don't think so, Catherine. Our trip begins in the Leicestershire town of Loughborough. in the Staffordshire city of Stoke-on-Trent. Celebrities waiting, where are those girls? There they are. About time too. This should be fun. I like adventures like this, don't you? Oh, look, there's a DeLorean! That's just like mine used to be. See, I never should have sold it, man. -Hey, I should help you out. Hi, how are you? Nice to meet you, Tony, how are you doing? Jimmy, how nice to meet you. Oh, you're warm. It's freezing out here. -What do you think of our car? -I know, it looks it. -I used to have one! -because Margie is pretty hopeless at driving. Don't mince your words, then, Catherine. The keys are in there. Catherine teams up with Jimmy and Margie has paired up with Tony. It's kind of a generational thing. and there's some real love in the DeLorean. -Cos I used to sing in Japanese. -Oh, my gosh. You are so talented. -I hope you can buy antiques. I'm sure Jimmy will be just fine, Catherine. What about Tony and Margie? We go in the shop and then you sort of have a look around. You look for dirty tickets, cos they've had it a long time. Had it a long time. That's a good tip. better watch out, because this bunch are ready to pile in. Tony the tiger, he's ahead. Let the dog see the rabbit, you lot. Margie and Julie are going to have their hands full in here. Go on, darling, you go upstairs. You go up. An owl. My mum used to collect owls. -Had this in your bedroom, this was all you had. Do you remember? Look at the ways to grind stuff. -Put your finger in there, mincemeat. No, please don't do that. -Glasses. Put your bins on. and she's spied a rather delightful sugar shaker. Early part of the 20th century. It's a bit rubbed, which is not good news. It depends how much money it is. It is silver. It is silver. The fact it's boxed makes it quite nice. are usually popular in the saleroom. -Ah! Got a better mark. That's the sign of a good piece, every part of it is signed. Yeah, so it's about 1920s. -cos it's a bit wibbly wobbly, isn't it? -Yeah, needs a bit of attention. -The best, best offer on that, really, would be 35. -We're not arguing, are we? -No, I think that's good. That is good. We got the sugar shaker for £35. -That's not a bad choice, is it? Now, what about our rascals upstairs? Yeah, but I'm OK... I don't have to win, but I want to. -Who doesn't want to win? Come on! -Yeah, this is a game. -Do you think Tony is competitive? I think Tony has got a little tiger in him. Now, what's this you've found, Catherine? That's kind of cool, isn't it? They're miniature ship lights, port and starboard. -This all looks very modern. Julie and Marie have moved upstairs to help this pair. I mean, what about that fan at the bottom? that lovely retro fan. -I can do that for 25 quid for you. That's generous, but will the £15 discount sell it to them? Look, if we pay 25, it needs to make £40, £50, really. Yeah, so we really need to pay, like, 10. -Yeah, this is a green and a red one. -You see? You can kind of see it's green and red. I could do 15 for the pair. Can you throw in the fan? He wants a lot, don't he? Well, no, I don't want to be cheeky, but I want to win. So could we have these and the fan for a tenner? What, you want to give me a tenner for the fan? Come on, can we push it a little bit? How about 12? -Meet in the middle, between 12 and 15, what's that? Ah, I love you! All right, 14, and now we're your biggest fan. We need to shake your hand and say thank you very much. I don't even know what we've paid, I don't know what we've bought. After a bit of Jimmy schmoozing them, we have two lots. £7 for the ship's lamps and £7 for the fan. That's ridiculous. Ah, I spy the opposition. Have you bought...? Have you spent quite a lot of money? Catherine Southon, just mind your own business. We're getting a little competitive, are we? Competitive? You've just shown them what you bought, you ninnies. Back to Tony, and his eyes are drawn to something. Oh, that's interesting. What's that? Yeah, look at the quality of that. -Oh, that's beautiful, isn't it? but he does love his threads, and this looks top quality. I mean, who or when and where could you wear it? Do you think that's a possibility or not? -I can't believe the nick it's in. -Are you around? Sorry, Julie. Do you know anything about the history of this? Yeah, I realised that. And it's an evening coat of some kind. -Yeah, and it belonged to a lady's mother. -I mean, I don't think she's hardly ever wore it. So what sort of price is it? I've got £50 on that. -It is unusual, but that's too dear. I think there's a little bit of movement on it, though. I mean, what about £30? -What are you thinking, then? -Are we being really mean? -Come on, you won't offend me. -Well, let's go for 25. I don't want to go any lower, cos it's not fair. The intricate Victorian lady's coat for £25. Thanks, Julie! Meanwhile, Catherine and Jimmy are back in the DeLorean. Our happy duo are having a rest from shopping. down an English country lane. to beat the rest of the world in the late 1950s. Now, that's what you call an entrance. If I can get out of this thing. Nice sunny day for you. for training and development in the world of motorcar racing. -There was actually Grand Prix here in '36, '37, '38 and '39. ..which became a US and British Air Force field. of Grand Prix racing cars in the world. Grand Prix cars from before the war right through to the 1970s. It was all about learning lessons and how to build a Grand Prix car. Look at the green. I love the British racing green. This is immensely complicated - a V16 engine. 1.5 litres with a supercharger. to some of these other cars through the '50s and '60s. Vanwall F1 cars in the world. of car technology and beating Brits to the chequered flag. the first time ever a British-built car won a World Championship race. Vanwall were only racing for four years. Not only did they win races but they changed racing car design for ever. -Lower and sleeker and faster. -Look at that body style. It's so sleek. This is Graham Hill's World Championship-winning car from 1962. -Yeah, it's the proper thing. in the heritage of British motor car racing. Only fair that Jimmy gets a shot at burning some rubber. -Hang on to your hat, sir. Here we go. We're ready. I'm going to get out so quickly just in case you start driving again. Jimmy's driving is amazing, but I feel really quite queasy. Were you both in the same car? I just was a racing driver. What are you talking about? I think Catherine could do with a cup of tea. How British! of some of the greatest British drivers of all time. Tony was a little 'un finding his voice. my dad would stand me on a table. He'd play the piano and I would sing. and give me money for singing. I thought, "Hmm, that's a career." Margie and Tony have made their way to the city of Nottingham. is next on their road-tripping expedition. and 200 dealers selling their wares in here, and that's a lot. We've got to win. We've got to beat Jimmy. Margie and Tony have £340 left to spend. Finally, Margie has sifted something out. What's this? Are they copying Jimmy's ship lamp purchase from earlier? Do you think that's a sellable thing? It's an original, isn't it? -Do you like it? Shall I put it down here? has been electrified for use as an interior design piece. That's been on a ship or something. It looks very new, doesn't it? -A marine lamp. Do you like it or not? -But you're not happy with that? -It's an antique, isn't it? -Well, shall we just see how cheap it can be? Liam is on hand to assist. The ticket price is £80. Would that be a really good deal? Obviously the cheapest price you can get. Well, I was thinking about 50. I don't think we can go to 50. If I had to apply a bit of a discount, I'd do £60. As an in-between. I'd give you a chance to make some profit. I'm not sure if Tony actually really likes it. Anyway, time for a rest before you do it all again tomorrow. Our musical maestros don't need a radio in this Bentley. It's party time with the fellas. today is the day we will spend. I want to spend. Today, let's spend. launched into the world of antiques full of gusto. meaning they have £280 to spend today. the two ship's lamps and the retro fan. They still have £386 left to spend. The troops are assembling in the town of Telford in Shropshire. Look at you two, you're back to the future. -We are, we've come back. -You're in charge of the Bentley, all right? -Do you want...? Oh, go on, then. Come on, let's go. Let's go shopping. Tony wasn't always in showbiz. As a young man, he had a 9-5 and a boss. "Look, you've got a choice to make. "or do you want to be another Adam Faith?" With his tongue in his cheek. -"I want to be a singer." He said, "Well, I'm sorry, but we're going to have to let you go." Good thing your boss did, eh? the pretty town of Much Wenlock in Shropshire. So what was life really like back then, on tour with The Osmonds? I mean, what was going through your mind? Were you having fun? It was so crazy back in the '70s. It was kind of alarming, in a way. you were in them, and hiding under the tables of a Chinese restaurant. -That's just another world, though, isn't it? I mean, something you'd see in a movie. But that was my life. in this lovely emporium called Memories. Get spending! You've got over £380 to splash. All right, I'm feeling good, feeling good. After you. Ladies first. -Lots of cups. Lots of china. -It's like the Mad Hatter lives here. Catherine and Jimmy have a language all of their own. -Oh, really, so it's a tester. -..to show the biscuits that they made. Let's get a better look. Owner Mary is being very helpful. -Is there anything in it? -Jimmy wants it to be full of biscuits. That's got to be a discount. There's nothing in it. -Oh, I'm sure we can arrange that. -What am I going to do with a tin? What's on it? How much? Unfortunately it's in at 40. I kind of need it really good. how about we meet in the middle? -I would do 18. That's the best. and then see what else we do? Cor, Jimmy is confident when holding the reins of sharp negotiation. But what's next for our road trip buddies? Everybody is collecting vinyls again, you know? Hang on in there, Catherine. -Are you having a struggle? -Oh, yeah. Crazy... That's yours! -It's at the top, Crazy Horses. Super cool. Jimmy has a light bulb moment. Do you have any record players? Yes, there should be two around that area somewhere. like this guy right here? You've got Long Haired Lover From Liverpool on here as well. -I've got two songs on there. See, I know your songs better than you do. a record rack and a record with two of our songs on it? What's the good guy price? Normally, it would be about £40 for the record player, £10 for the rack. Best price. Well, I don't want to push... Can I ask this? If we do this, can we have the tin for 15? -I love ya. Let's do it. Crikey, Moses, poor Catherine didn't get a word in there. Two lots bought, and Jimmy is on the prowl for more. Look at this, this is cool. -Look at those baby drawers. What do you put in there? Tooth picks. I mean, what do you do? There's like nothing to put in there. -Is it? You're such a nice lady. He's gone platinum with the charm. So what would you do? What would be the best price? 189. The very best would be 125. Can that possibly go down to about 100? I could probably do 100 on that, actually. -How much for the phone and that? -There's no stopping you, is there? Look at that together, it's awesome. Yeah, it does look good. Sounds fair, Mary. But I suspect Jimmy is up to something. What we'd really like to trade you are these mariner lamps. -It's like port and starboard. -Do you want me to go get them? -I could certainly have a look, yes. -I'll go and get them. and he's being super canny. He only paid £7 for those lamps. They are fairly modern. There's some marking on the top. -What are you hoping to get for them? -Where are we at on this one? for 25, that would be really good. Yeah, I'd rather do just 20 on these. You're so nice. Let's do it. Thank you for doing that. You rock, eh? Well played. and the Bakelite phone cost £112. The '70s records lot for 25 and the biscuit sampler tin for 15. Hello, somebody's nicked the engine. Let's return to Margie and Tony. to the Museum of Iron in the village of Coalbrookdale in Shropshire. before a glittering career in showbiz. -When I left school, I went to work in an office. Oh, it was absolutely fascinating. in iron making in the early 18th century. which made it possible to produce commercial iron cheaply. of pioneering excellence at the dawning of the industrial world. Margie and Tony are meeting with David to find out more. This was the derelict old furnace that Abraham Darby took over. he started drawing off the new metal. -Yeah? What sort of things did they make? It all started with the three-legged pot. the beginning of mass production of cast iron. This is an example of the ones he made? Absolutely, this is an early Coalbrookdale pot. when they were still exported to other countries. -It's not too heavy, you see? which was about 5-10 tonnes a week, went further. He was producing about 150 of these, apparently, by 1713, a week. heavily used for both domestic and industrial purposes. the cylinders of some of the very earliest steam engines. So basically, this innovation fuelled the Industrial Revolution. -steamships all stemming from this. the veins of the Darby lineage. first industrial iron bridge, over the River Severn, in Coalbrookdale. this bridge showcased the versatility of iron to the world. of constructional ironwork, architectural ironwork. And it is also beautiful. -of the River Severn here. advances of Abraham Darby I.
colonial and military power in the 18th and 19th centuries. -David, thanks for looking after us. -Is it tomay-to, toma-to? One of those things. -I feel like I'm getting out of a spaceship. Ooh, look at that, bit awkward. Memory Lane is owned by the lovely Holly. If you find anything, come to us. -Can we wheel and deal with you? GIGGLING: You might have met your match, Jimbo. Hey, Catherine, check this out. This is cool. Wouldn't that be neat, like, on a shelf? What is it? -Oh, it's a coffee grinder. -This looks like a particularly good example. -And it's worth a second look. -It's kind of cool, look at that. -I think it'd be amazing. -Yeah, just up on a high shelf or something, you know? and you're turning the handle. -Cor, he's quick off the mark. -Let's put ourselves out of pain. Ooh. Ah, that never stopped me, did it? Come on. but young Jimmy wants to take control...again. It's John? Hey, John, how are you, sir? And how much is that coffee grinder in the window? Is it American? No wonder I was drawn to it. He said 120 is all. which, I hope that didn't offend you. ..and ask her what she thinks, is that all right? -Are you going to sing to me before we finish? -Time's running out for our time together, Tony. Well, make the most of it, then. and this is Tony's last chance to find some more goodies. -Come on, let's get in there. -Let's do it, let's see what we've got. That Margie can be a bit of a nosy parker. -What do you have at home? -We go for dark wood. -Some of it is, yeah. How are Jimmy and Catherine getting on with making that deal? So, we know that our friend on the phone will go for 115 for this. -Let's do it, shall we? -I need to pay you. -I'm happy. I'm skint, but I'm happy. Jimmy really likes to take control. Could this be an expensive gamble or a clued-up, profit-making success? Is that a clocking-in clock? Look at that. Love those, don't you? -Used to have that at the steelworks where I worked. -For the workmen, yeah, they used to clock in. After a trip down memory lane, what's next for this twosome? -Shall we go outside? Do you want to go outside? Sorry, I'll do it again. Sounds like a pick-up line. -And the helpful Jackie will accompany them to talk prices. Right, now, we've got to look at everything, haven't we? -All right, Mrs Bossy Boots! -That's interesting. Is it stone? -It's got style, that, hasn't it? How was Tony meant to know that? The ticket price is £67.50. -And the old boxer there. People like dogs. -Oh, is it a bulldog? -Just don't know what's going on here. -Have you had him a while? Cos the sign's washed out. Two cats in the planters. Oh, look at that. Hello! -Those are two bulb planters? -I'd say they are, yep. -So what sort of price are they? -Can they be a good price? I could do those for you for... Let me have a think. Cos you're pausing, I'm going to come in with 65. -I was thinking more like 75.
it's time for Tony to take control of the dealing reins. -I'm moving towards this, Jackie. What I want to know is, what's your best price? I could do him for...35. I can do the bulldog for 15. And then we've got to consider the planters with the cats in. Yeah, I'll do 65 for the planters. -Well, I think that's fair, thank you. Yeah, I think we might need it. What a whirlwind buy...of three items costing a grand total of £115. we've reached the end of our shopping spectacular. And Catherine and Jimmy are in high spirits. -I like Neil Diamond. Do you? "Do it! Yeah!" You know? Now for the big peek at one another's buys. Wow, how did it go? Did you enjoy yourselves? -Did you have a good time? -I had a great time. -Did you buy some cool things? -It depends what you mean by "cool". Come on, we got to see 'em, I'm excited to see 'em. Hang on, hang on, we don't want to spoil anything. -I think this bunch have had too much sugar. -That is... Oh, we can't touch it. -I picked that. - Did you? It's a Victorian evening coat. - Amazing. -You picked that at the first shop. This is a marine lamp. - Yes, cos you saw our little lamps. Right, OK.
We got to shake them off our tails, haven't we? OK, so you thought you would copy us. And in there is a silver sugar shaker. -Oh, don't touch it. It's all right. -She's the queen of silver. -- OK, would you like to see ours? -On your marks, get set, go! -Yeah, that's a coffee grinder. -No, that's a hot chocolate grinder. -Are you a hot chocolate man? -Yeah, I'm a hot chocolate man. And then this, I love that vintage. We got that at the first place. -Oh, God, that's good, I like that. -This is what's really cool. -Yeah, I love these little chests. -So that's one lot there. To go with the telephone? -And how much did you pay for that? -I love that. That's really nice. -- Have you noticed anything missing? -We traded and got a better deal on that. Jimmy and Catherine are sharpshooters, Margie. -I've got to show you this. -He's up for it, is old Jimmy. -Top Of The Pops. Crazy Horse. Long Haired Lover From Liverpool. No kidding! Who sang that? Who sang that? The Jacksons. I love The Jacksons. Yeah, it's a record player with the records in the little display thing. I signed it, which is really going to take the value down, you see. No, you're going to do OK with that. -Margie, can I show you one last thing? -This is cool, I like this. is a little miniature Huntley & Palmers biscuit tin. -So I think we have bought completely different things. -It's going to be an amazing auction. And all I can do is wish you the very best, Catherine Southon. -It's going to be great. - Yes, well, thank you! What a bunch, eh? But what do they really think? You know what? Those things are modern, though. They're modern. I'm surprised he's in the position where he has to go and buy a fan. I think we did well. Good job, buddy. in Staffordshire - stand by. of their Road Trip adventure. -This is my first auction, so this will be fun. -I've never been to an auction in my life. We're going to find out pretty quick which one of us is rubbish, right? It's tipping it down as the girls await our celebrities' arrival. -Quick, quick, quick, we're getting wet! Let's do this. This will be fun. This will be fun, come on. Get in, before you catch a cold. and the man in command is auctioneer Lee Sherratt. What do you think of their offerings, then, Lee? I just realised that I used to have one of those. two, I think it was. so I'm sure that'll do well. Excellent. Jimmy and Catherine were today's biggest spenders. Jimmy proved to be a sweet-talking guy with a sharp business acumen. They spent £274 on five different lots. knew what he wanted and persuaded Margie to buy into vintage clothing. They spent £235, also on five lots. It's a packed house as our glittering stars arrive. Get ready, the auction is about to begin. -This is it, this is the moment. - Do you think we're going to make some profits? First up, it's Jimmy's retro fan. I mean, it's a piece of art, it's of an era, isn't it? Come on, what am I selling myself for? £30, 25, come on, where are we? £20, £10 to start me, maybe £10? -10 bid on my left. ..more than this, surely? At £10, 12? 10 on the left-hand side. Maiden bid of only £10. 12. At 12 now, is it 14? Feel like I'm riding a horse here. -Any more, then, at £14? -£14. It's good, isn't it? Doubled your money. Splendid result, Jimmy. -Yes, we're doing famously, aren't we? It's your turn now, Tony. The sugar shaker is up next. -Loads of commission bids left on this. £40, straight in at 40, I'll take 45. You made a profit! Well done. 50, now 5? On commission at £50. Carry on. Way to go. All right, now it's on, buddy. I'm going now, I'm going now. Uh-oh, the buddies might be at war, but it's sweet success for Tony. Tony's Victorian evening coat is next. And we've made a new friend to model the garment. Modelled, of course, by our, uh, modeller, Ros. Give a little twirl, there you go. 25, 30... 30 bid, now 5? -Come on, it's worth more, surely. 40, 42, I've got you, 44. For a dress? Give me a break. He's definitely out at £50, stuck to his task. -It's you. You've done it. The model's done it. -How did you do that? I'll let you do the shopping from now on, all right? Tony's got taste. Another sizeable profit for Margie's team. You are on fire. Tony the Tiger, see, what did I tell you? I can't believe it. I can't believe it. Back to Jimmy now. The engineer's drawers and Bakelite phone are next. -This is us, this is us. -Any time you want a job, mate, come and see me. £30 the lot, get me £20 at the start of the bidding. -£20. All over the place. Like a Mexican wave at the Vale there. £20 I'm bid now. 22, 24, 26, 28 and 30. 2, 4, 6, 8. 40, 2, 4, 6, 8. 50, 2, 4, 6, 8. Where's 4? Come on. At £62, the hammer's up. Being sold at £62. -Well, you did all right. but it's a hefty loss. -Let's not talk about it. Tony's mariner's lamp is next. Well, we know it works. -We paid too much money. -Oh, what did you pay for that? At 32 to your left-hand side. Any more now? At £32 now. The hammer's up. All done now at three-two. And so you should be, Tony, you're still in the lead. I think that's the end of our problems. -we've got a lot of problems. Let's hope you don't. It's Jimmy's biscuit sampler tin next. And it's got "Osborne" on the side. Aww. But you're not called Osborne. Not, it's another family, but it's close. -But it has "Marie" on the backside of it. Put that in the bank and draw that interest, right? -£15 for it, where are we? Give me a 5. 5 I'm bid. 6? 6 I'm bid. 7 I'm bid. -£14. Commission at £14. £14. Hang on, hang on! 16. -19, then. £18, still commission. -£18, are we all done? -He's got a big commission. -All done. Sold on commission. Yeah, but it's, like, minute. I don't care. I just don't want to lose any more money! I hear you, Jimmy. It's still a profit. -It's hard to get a pound, isn't it? We're sticking with Jimmy now. The '70s record combo lot is next. -Come on, let's get ready. Oh, here they go again. Hold on a minute, dear. Right, who's going to bid me £50 for the lot? £50. Blimey, feel the love in the room. # Till I'm old and grey... # Your turn! It's a bargain! It's a bargain! -Right, come on, let's start it at 50. -It's got to be worth that, just for the LPs. 50! £50 is bid. 52? 52? Don't let that ruin it! Right? Are you sure this time? At £56, then. -All done and finished at £56. -56, do we hear 57? Sold at £56, number 45. Thank you very much. That was cool. What a brilliant singalong, and a lovely profit. Well done. I don't know where we are. I've completely lost it. -All I know is I shut my finger in that record player! Back to Tony. The weighty planters are next. Several commission bids left on this next item. I've got £50 bid straight in for the two. 55. No, we're not, carry on. 55, 60, 5, 70, 5. Now we're up to £95 on commission. I shouldn't have told Tony Christie to shut his mouth! £95 on commission and all done. I think Tony likes this auction lark. We've got high hopes for the horse's head now. but can they turn a great profit? £30 the lot. Got to be worth that. 10, 12, 14. 14, 16. 24, 26. 26. 28, 28. -30 bid now. 2? He says no. -Oh, come on, this is cheap. Now we go. Here we go. Hang on! 32, 34, 36? -Come on, got to get me up to 50. 46, 48, 50, 5, 60. Right-hand side at £55. Where's £60? -The hand's up, then, at 55. Any more? You guys... Can I touch you? Right-hand side, being sold at £60. Tony, you're coming up with the profits today, man. the American coffee grinder, is next. This is the decider, cos you've got something really good here. -He's bidding at the back. And 2 and 4 and 6 and 8. And 60 and 2. Out. In the room at £60. Take 2 more. 2, fresh money. 62. 64 now? At 62. 64, you've been with me all the way. -No, no, you're doing a great job! -Well, been with me all the way through. Thanks for your bids, then, at £68. -Being sold, no mistake, then, at 68. -Oh, that is a rare thing. -That is a really good item. -Yeah, I'm still proud of it. Someone's got an excellent deal, there. Have you enjoyed your first auction, chaps? -it's been brilliant. I'd like to do another one. -That's good. Now you know the ropes. Now you know what to buy - dresses - and you'll be fine! You'll have a whole wardrobe full of dresses! But I had the best time. -Shall we get out of here? That was exciting. Let's tot up the scores. Who will be today's winner? Jimmy and Catherine started out with £400. they made a small loss of £95.24. they made a profit of £8.54. making this pair of luvvies the winners. All profits to Children in Need. -Was that crazy or what? -I loved it, I loved it. -Do you want the good news or the bad news? -The good news is that you have won. -Very well-deserved, I must admit. But only by... - By a huge amount. -And the bad news is that we lost. But we tried, and I still love what we did. But it's been the best. It's been the best, buddy, congratulations. It was a close one, and we'll miss you, fellas. -I'd do it again, wouldn't you? We might just do it on our own without all those TV people! Two stars of the seventies, cool crooner Tony Christie and pop royalty Jimmy Osmond, are accompanied by experts Catherine Southon and Margie Cooper. Blasting off from the Leicestershire town of Loughborough, they head for an auction in the Staffordshire city of Stoke-on-Trent. Tony squeezes in a visit to Coalbrookdale, the place where groundbreaking techniques were developed that kick-started the Industrial Revolution. Petrolhead Jimmy gets to whizz round the historical race circuit at Donington. The big auction finale includes a sing-along like no other, but which musical maestro will clinch victory?